About the Wine: The Flora Springs 2016 Cabernet Sauvignon is made from 84% Cabernet Sauvignon, 11% Merlot, and 3% Malbec harvested from the winery’s Napa Valley estate vineyards. Grapes were hand harvested then cold-soaked. Wine was aged in a combination of French (79%) and American (21%) oak barrels for 19 months. Flavor Profile: Open the bottle of the Flora Springs 2016 Cabernet Sauvignon and find jammy aromas of boysenberries, blueberries, and black berries with just a hint of chocolate and delicate oak. This Cabernet Sauvignon emits a dark, vampiric maroon on the pour, like old blood illuminated by moonlight. As its poured, this wine is immediately aromatic, giving off full-on scents of those plump fruit smells that just overtake anything else happening in the kitchen. In the glass, the wine is nearly completely opaque, but for a thin line of a rose-petal hue along the perimeter. 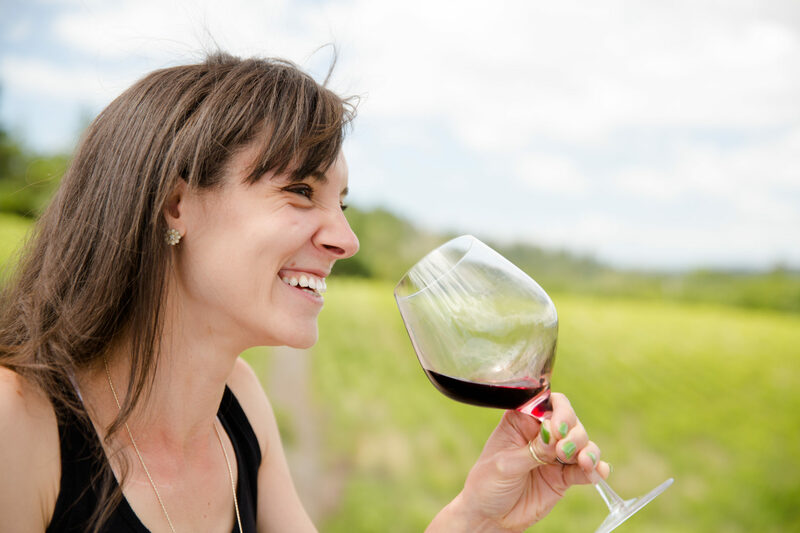 Initial aromas from the glass are as expected based on the nose from the bottle. But you can also sense a bit of fresh herbs like basil and spearmint and perhaps a bit of currant as well as some floras. A deep breath in reveals a strong dose of acidity. Swirl and those fruits become alive as the acidity becomes integrated. You’ll find a hint of mushroom-like umami, but this wine is definitely about the jammy, compote-y smells of those berries, elevated with a dash of chocolate. The palate is full with plushy tannins that gently coat the tongue. There’s a strong acidity that lends a bit of lingering to the textural finish. Dominant flavors are of dates, dehydrated/rehydrated black and blueberries, mocha, fresh oak wood. The herbaceous qualities come through on the back palate, as does some licorice-like notes. The finish is like a warm, cottony hug in the mouth, with a lingering acidic tingle around the gums that actually refreshes the palate and invites another sip. 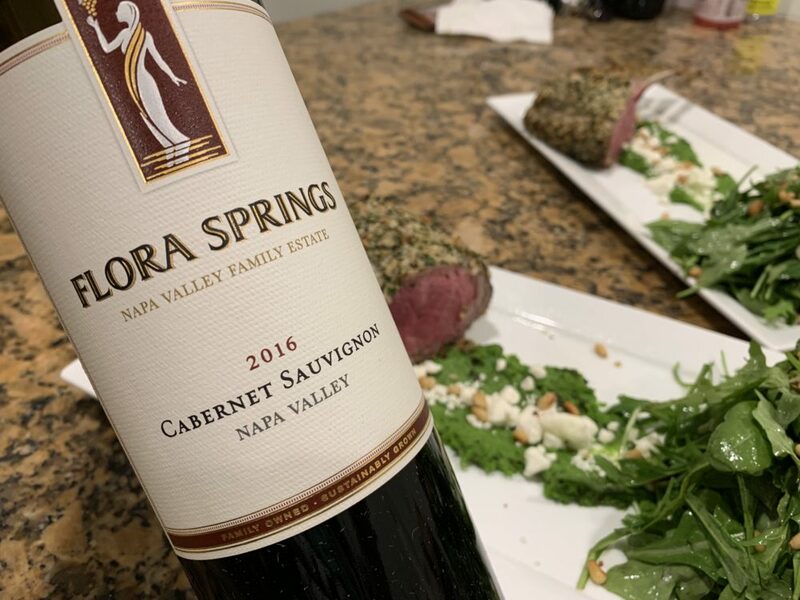 Food Pairing: I paired the Flora Springs 2016 Cabernet Sauvignon with an herb-crusted rack of lamb, a pea and mint purée, and an arugula salad. Loved this pairing. The acidity cuts through the gamey lamb, yet the gamey lamb elevates the fruit flavors. The peppery salad actually worked to round out the texture. The purée highlighted the herby notes. All-together this pairing was perfect. And, I must add, that during the course of the evening, this wine did open up, and the more it did, the more those already plush tannins just melted in the mouth. More Info: I received the Flora Springs 2016 Cabernet Sauvignon as a sample for review. (Cheers Miriam!) For more information about Flora Springs, their wines, and to purchase wine directly, please visit the Flora Springs website.